Stephanie Ballom in New in Chess! Stephanie Ballom in “Sweet 16” magazine back in 2005. Stephanie Ballom was a standout at Mansfield Highschool in Mansfield, Texas and won a $30,000 scholarhip to University of Texas-Dallas. Despite winning this opportunity, she decided to attend Texas Tech University. Now in her 3rd year, she is able to keep chess as one of her activities since GM Susan Polgar took a position there to run SPICE, the Susan Polgar Insititute for Chess Excellence. Stephanie is certainly helping out with the SPICE program and was apparently part of the host committee for the strong Reshevsky Memorial organized by SPICE. 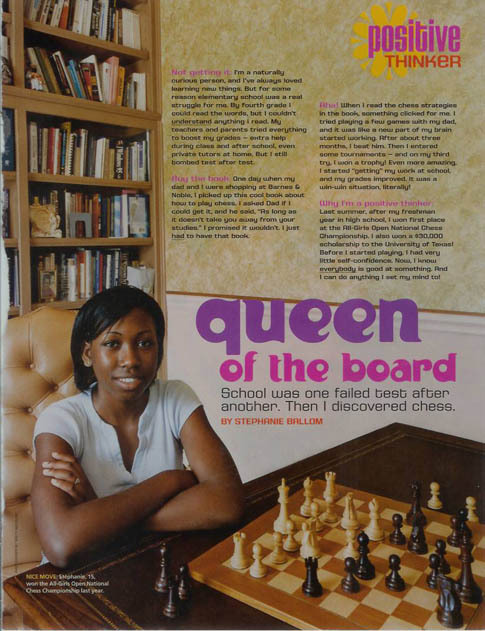 Stephanie appeared in the NEW IN CHESS magazine (2007 #8, page 92). I was surprised to see her in the picture as she seemed surprised when I informed her about a month back. Perhaps her study of Russian will help her if SPICE continues to organize strong tournaments. Correction: Stephanie is a Junior now at Texas Tech and just 18 years old.